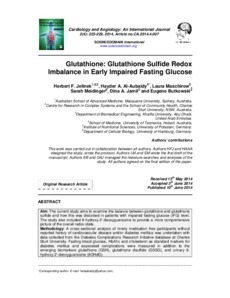 Aim: The current study aims to examine the balance between glutathione and glutathione sulfide and how this was disturbed in patients with impaired fasting glucose (IFG) level. The study also included 8-hydroxy-2’-deoxyguanosine to provide a more comprehensive picture of the overall redox state. Methodology: A cross-sectional analysis of ninety medication free participants without reported history of cardiovascular disease and/or diabetes mellitus was undertaken with data collected from the Diabetes Complications Research Initiative database at Charles Sturt University. Fasting blood glucose, HbA1c and cholesterol as standard markers for diabetes mellitus and associated complications were measured in addition to the emerging biomarkers glutathione (GSH), glutathione disulfide (GSSG), and urinary 8-hydroxy-2’-deoxyguanosine (8OHdG). Results: The IFG group had a mean blood glucose level above 6.1mmol/L being significantly higher compared to control (P < 0.001). Traditional clinical markers were all within the normal range for both groups. However the GSH/GSSG ratio (8.53 ± 5.4 vs 6.62 ± 2.2, P = .04) was significantly lower in the IFG group. GSH and 8OHdG, being markers for oxidative stress, were not significantly different between the two groups. Conclusion: The free radical related changes in metabolic redox pathways are linked to oxidative stress and related pathologies but may not be associated with disease progression, providing an explanation why conflicting results are presented in the literature concerning any individual biomarkers and risk of diabetes. Our study included individuals with no medication use and mild hyperglycemia (impaired fasting glucose) and indicates a pro-oxidant response to mild-moderate hyperglycemia with a moderate rise in oxidative DNA damage.